No chance in the world I will be renewing in June at that price point with nothing overly concrete locking in for their future. 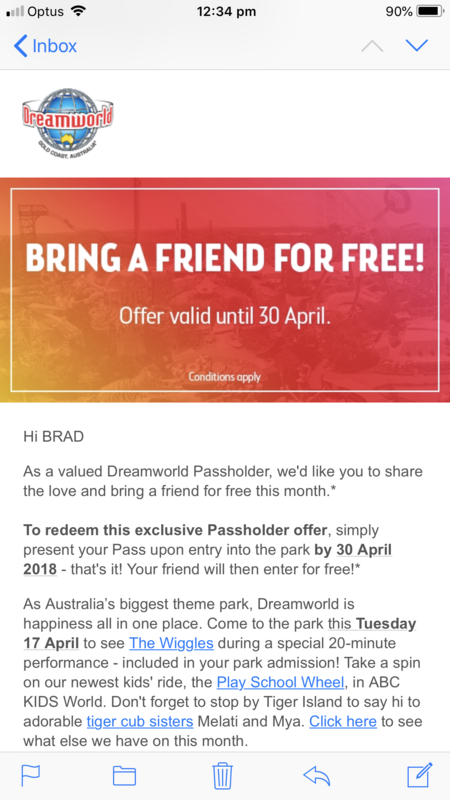 Dreamworld Annual passes have been at that price point for a few years, the cheaper season passes (currently until December 24 2018) are still at $99 and cheaper through RACQ/Entertainment Book ect. Edited March 1, 2018 by Jordan M.
Me neither I'm afraid. I will be interested to see the flying theatre when it opens, but to be honest it doesn't really sound so different to a 7D cinema to make it worth paying that much. Not when there aren't really any other attractions that interest me which I can't get down the road at Movie World and Wet & Wild. Maybe just the occasional visit to Q1, but you can get a separate pass just for that, or I might even just pay per visit since I only go a couple of times a year. 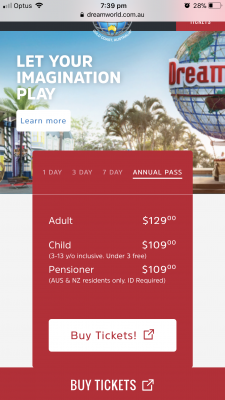 Think you’ll find season passes will quickly disappear, given the landing page on their website no longer mentions them and focuses on the annual pass, which has never been the case until now. Craig mentioned he was happy the discounting phase of the past decade has now ended. Its still pirced as "we might as well buy a yearly pass for a bit extra. 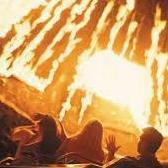 We only have to come again once in the next 12 months to pay for itself, plus you've got white water world there, the kids will go plenty of times when its hot", or some sort of similar conversation that frequently occurs. I think they actually dropped the price slightly from what it was prior to the accident? I keep thiking they were something like $134.95 before. I don't even live near the Gold Coast but I'll still probably renew my pass. It's nice to have the luxury of just popping into all the parks when I'm up on a work trip, etc. Even if I only go twice, it's still cheaper than two 'one day passes'. Also I can never have enough valid season passes in my wallet. They make for great conversation starters! I won’t boycott them as at the end of the day they employ close to 1000 people from the community and, in my opinion, it would be to the gold coast’s detriment to lose DW from the landscape. Mwahahaha, less than a year ago you wanted us to pay $230.00 and now $129.00 is not ok.
Sarcasm tags noted and all but a big difference to boycotting by choice or not being able to afford passes for the family at that price. Upfront large fees are hard for most these days which is why most bills can be broken up and paid monthly etc.. This seems like a real bonehead move. Don't get me wrong, I'm glad the 'race to the bottom' appears to be at an end. But the thing is with Village raising their price from $99 they've kind of given DW the wriggle room and a spot in the market. DW can now park themselves at that $99 price point and get all the people who will inevitably balk at how expensive Village are now. Happy days, they were flogging passes off significantly cheaper than $99 at different times during the year so if they can hold firm at $99 they'll be doing better in terms of how much they're charging per pass and will sell more come Village renewal time, particuarly given most guests probably haven't had a DW pass for a long time. By raising their price to almost inline with Village's local pass price they can kiss that advantage goodbye in one swift incompetent blow. Village raised theirs after the completion of two rides. 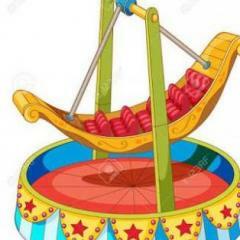 What did Dreamworld build -a kids' Ferris wheel? ++++++++++++++++++++++++++ Tiger Island & Corroboree expansion, Vintage Cars with koalas (DW's answer to swim with the sharks at SW) ++++++++++++++++++++++++++ Still to come this year, Trolls walkthrough & Flyover Australia. 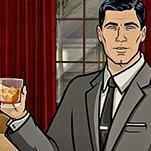 Don't forget the expanded entertainment line-up. Ice cream singers, dancers and the stupid fun patrol. Have heard there will indeed be a June 2019 (expiry) Season Pass released. 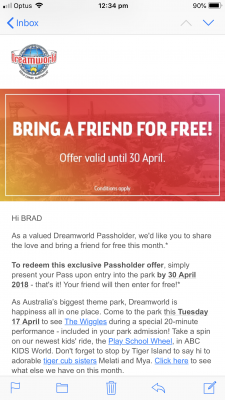 All DW passholders can bring a friend for free each day until the end of April..
Bring a friend for free is a bit Six Flags isn't it? Whatever it takes to get butts through the door. Yeah but Six Flags has rides and attractions you would want to experience with your friends. Don't see why anyone would want to buy a DW annual pass at this time...wait 10yrs or so and hopefully, they''ll decide they want to try again and have some truly decent attractions! Good start would be to actually make an effort with the Log Ride! Right now they need people through the gate. Who cares if the tickets are virtually free - nobody through the gate is the same financial outcome. At least with people inside the park they have a chance to make some money off of food and beverage, merchandise, photos and premium experiences (tigers \ koalas \ flowrider etc). I'm happy for them to give away the gate at the moment to get people in and prevent the park looking like a ghost town. If the park looks busy, it encourages more people to plan a visit. Whatever the eventual outcome of ownership is, right now they need to keep people coming in the door. Some of the friends getting in free will probably decide to buy a pass when they otherwise weren't going to. Sounds like a good marketing idea. Don’t hold me to it as I didn’t see it first hand but was told in Park yesterday that these “free” guests can upgrade to an annual pass for $40 in the park.. 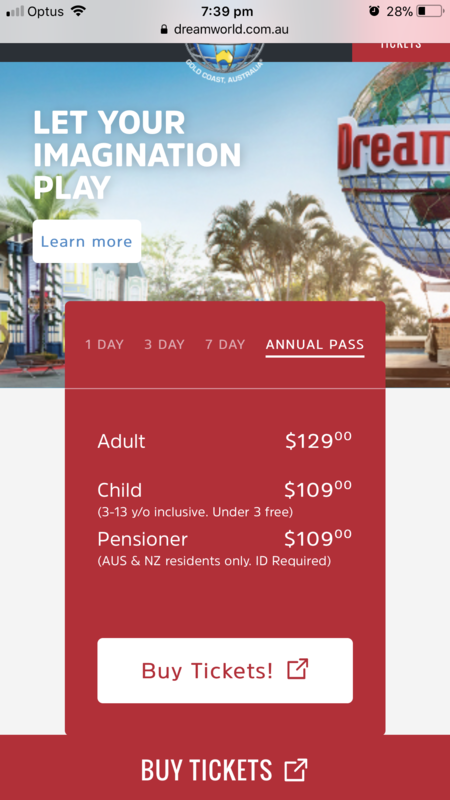 It's $25 to upgrade to a Season Pass (Until 24th Dec 18') or $35 for an Annual Pass. You can bring one guest in per day per season pass / membership up until the 30th of April. Took a friend today, and taking one tomorrow who normally wouldn't have brought a pass right now but at those prices it was worth it. Also worked with the Comm Games promotion, so effectively a $40 annual pass.